This product was added to our database on Thursday 15 february 2018. The F-15K Slam Eagle is a derivative of the F-15E Strike Eagle that is produced for, and partially produced by South Korea. The first production batch is powered by GE F110 engines while the second production batch received the advanced Pratt and Whitney F100 engines. While the F-15E and F-15K share most of the same external features, the F-15K has the APG-63(V)1 radar along with radar warning, electronic warfare, and communications systems produced by South Korea. Like the F-15E, the F-15K can employ the AIM-120 AMRAAM, and with the Joint Helmet-Mounted Cueing System, the AIM-9X Sidewinder. The F-15K can also employ a wide range of weapons including the AGM-84 Harpoon and Slam variants. 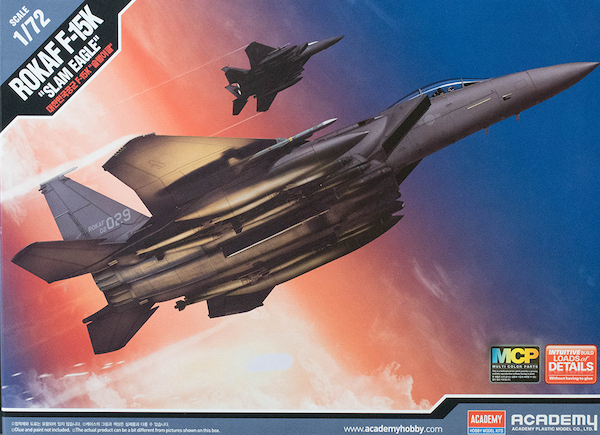 This is the lastest release from Academy - the 1/72 F-15K Slam Eagle. This tooling is essentially a reissue of their recent F-15E Strike Eagle kit with a change of decals, the addition of stickers and multi-colored plastic. Even the box art features the same two Eagle poses that are rearranged slightly along with a change of markings. When you look at the parts in this box, the surface details look better than most 1/72 scale kits and even some in larger scales. The engineering of this kit is outstanding and then you notice that this gem is a snap-together model. The kit is moulded in dark gray, light gray, silver, white, and black styrene, this kit is presented on eight parts trees (duplicate trees not shown) plus a separate lower fuselage half and one tree of clear parts.